While seeking to answer this question, it is recognized that we can only get a glimpse into a divine mystery which escapes our ability to fully comprehend. But we will seek to climb this spiritual Mt. Everest as far as our finite minds will allow us. Paul writes in Philippians 2:5-11: 5Let this mind be in you which was also in Christ Jesus, 6 who, being in the form of God, did not consider it robbery to be equal with God, 7 but made Himself of no reputation, taking the form of a bondservant, and coming in the likeness of men. 8 And being found in appearance as a man, He humbled Himself and became obedient to the point of death, even the death of the cross. 9 Therefore God also has highly exalted Him and given Him the name which is above every name, 10 that at the name of Jesus every knee should bow, of those in heaven, and of those on earth, and of those under the earth, 11 and that every tongue should confess that Jesus Christ is Lord, to the glory of God the Father. This passage speaks of the self-humiliation of Christ as He took upon Himself our likeness to come to earth to provide for us what we could not provide for ourselves. He left heaven’s glory to be clothed in human flesh to be our Savior. 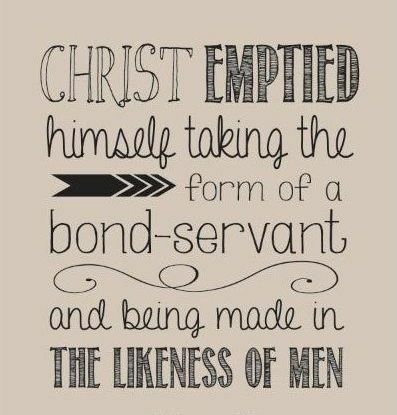 In Philippians 2:7, the phrase “made Himself of no reputation” in the Greek means “he emptied himself.” The question is: When he came to earth what did Christ empty himself of? The verse seems to indicate that Christ, who is the eternal Word (John 1:1-3), relinquished some aspects in the use of His divine power. The question arises, if Christ gave up any of His divine attributes can His act on the cross be a saving act since only One who is the God-Man can save sinful man? The answer, Christ did not give-up any of His divine attributes on earth He only self-limited Himself in the use of them. While Christ didn’t relinquish His divinity, He limited Himself in the full use of the divine attributes He possessed. He “emptied” Himself of the full use of all His divine attributes and by His divine power self-limited Himself in their use in some instances. It is only because Christ is God in the flesh, the eternal Word, that He can self-limit Himself in the full use of His Godness. More than an emptying or a loss of divinity, there was a choosing on Christ’s part, as the God-Man, a self-reduction or self-limiting of His full divinity while on earth. As an example, Jesus said to His disciples when speaking of when He would return, “But of that day and hour knows no man, no, not the angels which are in heaven, neither the Son, but the Father” (Mark 13:32). Jesus, though God in the flesh, relinquished and limited, while on earth, knowledge of the exact day and hour when He would return. While on earth Christ temporarily set aside His omniscience (ability to know everything), He didn’t actually empty himself of the attribute He just chose to self-limit His use of it. As well, while on earth Christ, as a man, was limited in His ability to be at more than one place at one time. He limited His omnipresence (ability to be with everyone at the same time) which He had with the Father. As with His omniscience, while on earth Christ temporarily set aside His omnipresence, He didn’t actually empty himself of the attribute He just chose to self-limit His use of it. Christ, while on earth, set aside the full use of His omnipotence in some instances in order to become a servant in our human likeness to dwell amongst us in order to provide salvation for us. He did not cease to be what He always had been but of certain attributes there was a self-limitation on His part in the use of them. One is truly omnipotent (all-powerful) when they can actually limit their omnipotence as Christ did!! He who hung the stars in the sky, came to dwell in a lowly manger. He who created man became a man. He who created the earth came to walk on the earth. He who men bow to worship, stooped to wash His disciples feet. He who created the sun to shine, died in darkness that we could dwell in His light. He could never be the King of our eternal future if He was not King of the eternal past. So my answer is that when Christ came to earth there was a self-limitation of His divine attributes rather than a self-emptying Himself of them. Because of His holy-love for humanity He limited Himself in the actual use of all His attributes though they remained in Him in potential, but not all were used in actuality. For in Christ dwelt all the fullness of the Godhead (Colossians 2:9); therefore, He was, by His power, actually able to self-limit Himself in the use of all His divine attributes. As the insightful theologian P.T. Forsyth wrote, “Christ’s emptying (self-limiting) of Himself is not regarded as the loss of true Godhead, but the condition of it. The freedom that limits itself to create freedom is true omnipotence, as the love that can humble itself to save is truly almighty.” In other words, God in Christ is truly powerful because He has the power to self-limit His power in order to act in the power of the cross and resurrection. Having such a Savior resulted in Paul exclaiming, “At the name of Jesus every knee should bow, of those in heaven, and of those on earth, and of those under the earth, and that every tongue should confess that Jesus Christ is Lord, to the glory of God the Father” (Phil 2:10-11).